Police are appealing for the public’s help to trace the people in these pictures in connection with a series of crimes. 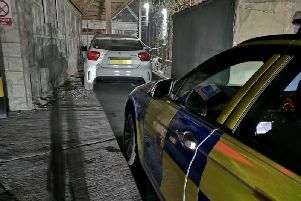 Officers want to speak to those featured in connection with a variety of offences across Derbyshire. Images may be of suspects or potential witnesses. Police would like to speak to the people pictured in connection with an offence at a store on Oxford Street in Ripley on June 4. It is alleged a female blocked a male while he de-tagged a number of razor blades. Both then left without paying. Officers would like to speak to the people pictured in connection with an offence in the Spring Gardens centre in Buxton. A man was allegedly approached by two females who took his wallet from his top zipped pocket on May 30. A man entered a store in Bridgemont and attempted to shoplift but was challenged and left the store. He then took a bike from outside the store and made off on it. Police would like to speak to the man pictured in connection with the incident, which occurred on May 15. A man entered a store on High Street, Ripley and selected a number of Olay product creams worth around £150 before leaving without paying. Officers would like to speak to the man pictured in connection with the incident on June 2. A man entered a store on Station Road, Darley Dale and took two bottles of vodka before leaving without payment. Police would like to speak to the man pictured in connection with the incident, which occurred on May 11. Three males entered a store on Low Pavement, Chesterfield on May 11 and allegedly used scissors to cut off three display phones before leaving. Police would like to speak to the men pictured in connection with the incident. Police would like to speak to the men pictured in connection with an incident at a store on Nottingham Road, Alfreton on April 30. It is alleged that males entered the store, selected various items and left without paying.